Though my husband’s colleague appeared to be satisfied with this answer, I found myself pondering my reply. 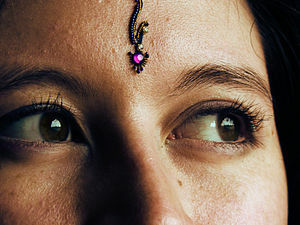 It isn’t just married women who wear the bindi, after all. And it also wasn’t the first time someone had asked me this question. The bindi probably has its roots in an earlier tradition of married Hindu women applying kumkum, a vermilion powder, to their forehead. And if she became widowed, a woman lost the privilege to wear the kumkum. I recall as a little girl in India watching my grandmother each morning go through an elaborate ritual. I secretly called it the bindi ceremony. She would sit at her antique dressing table facing an oval vanity mirror and carefully place the small red box containing the vermilion powder in front of her. Then she would vigorously apply Vaseline to the center of her forehead and using her index finger, carefully make a perfect vermilion dot on top of the Vaseline. I never grew tired of watching this fascinating moment. A few years later, when Grandfather died, my grandmother stopped wearing the bindi. When I saw her face bereft of its perfectly circular red dot, I felt a pang. It was as if a vital part of her had been plucked away. She had had such a glowing face, with a peaches and rose complexion, and now it seemed so barren. I was puzzled when I saw the change in her, but was too young to understand. Today as I dress my 4 year-old daughter and apply a colored bindi that matches her new maroon dress, I realize that a lot has changed over the years. Recently my friend Rita, who is in her mid-30s and has two young children, lost her husband. Rita has continued to wear her bindi despite her family’s conservatism. And the bindi itself has evolved from its traditional red to every imaginable color. The dot has also morphed into numerous shapes. Moreover with celebrities like Madonna and Naomi Campbell sporting bindis, the custom has entered the mainstream. To me, the bindi is a statement of who I am – I don’t wear it to flaunt my marital status or as a fashion accessory. Yes, it is all of the above, yet something more. It reminds me of my roots and upbringing. It also serves as a link between the past and future. It will be one of the traditions I will pass on to my daughters.